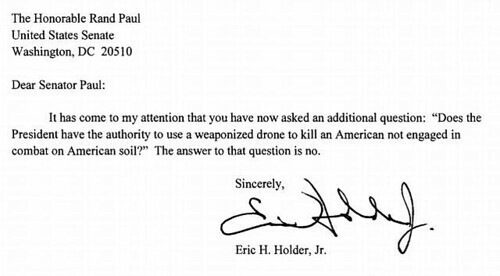 Eric Holder answers Rand Paul's drone question with a curt letter. Sen. Rand Paul covered many miles of territory in his filibuster yesterday, but after Sen. Ted Cruz arrived on the floor, a framework for the filibuster took shape. Cruz had asked Attorney General Eric Holder to answer a hypothetical question: Could an American citizen, in America, be taken out by a drone “while sitting at a cafe”? 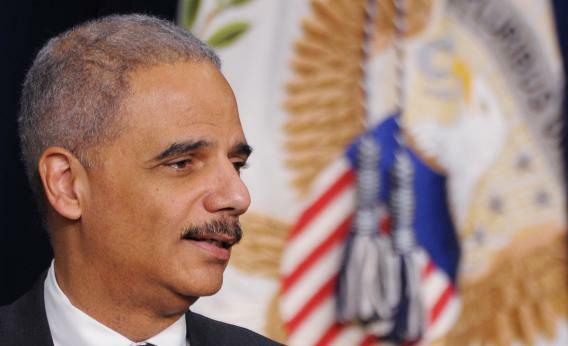 Holder blew off the question. “On the facts you have given me,” he said, “this is a hypothetical, I would not think that in that situation the use of a drone or lethal force would be appropriate.” When Cruz arrived in the Senate, he informed Paul of this offense, and Paul dug right in. This hour, Holder has sent a letter to assuage Paul’s concerns: The letter was released while Paul sat in for a CNN interview—his second of the day. It was good enough for Paul to announce he was dropping his objection to John Brennan’s nomination to lead the CIA.